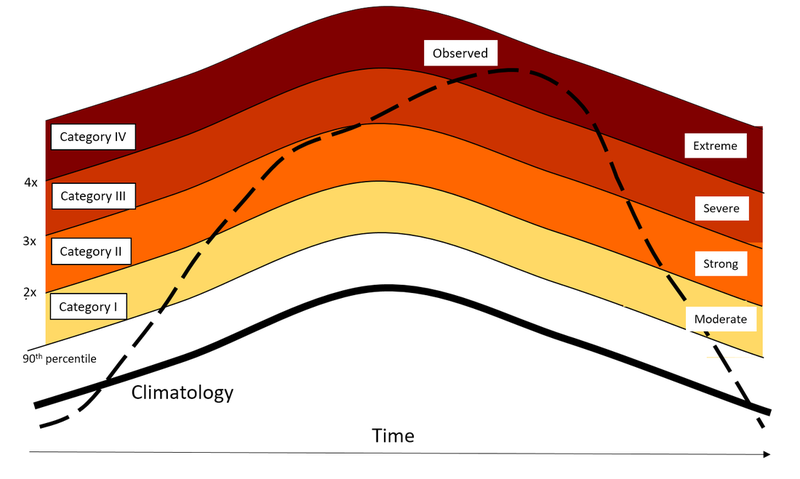 ​understanding marine heatwaves: their physical drivers, climatological properties, and ecological impacts. 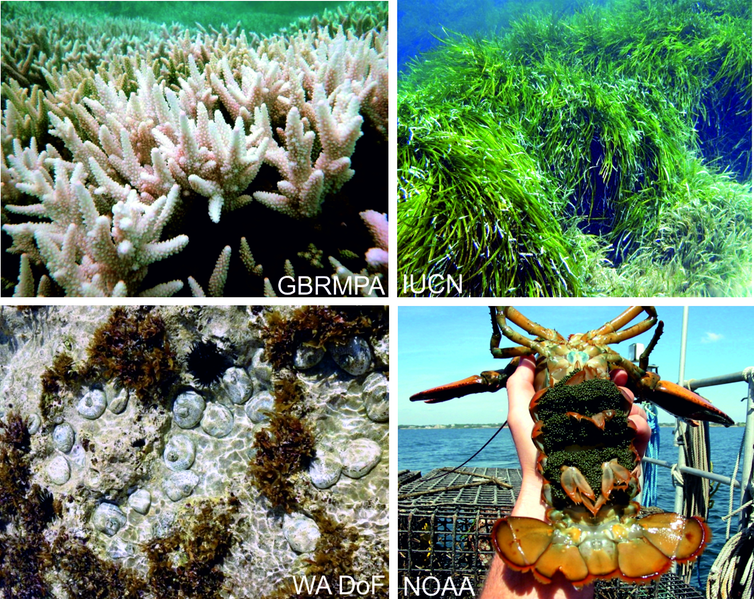 A paper published this week from our research team demonstrates the global impact of marine heatwaves on ecosystems, including biodiversity and the provision of ecosystem services. Media coverage includes The Guardian, The New York Times and National Geographic. A good review of 'the Blob', it's impacts, and the history and current state of marine heatwave research. You can read it on sciencemag.org here. Record warming has returned to the North Pacific recently. This time there is similarity but also difference past events there, including some interesting subsurface signals. Is this the "Return of the Blob", or something else? A news story with details available here. 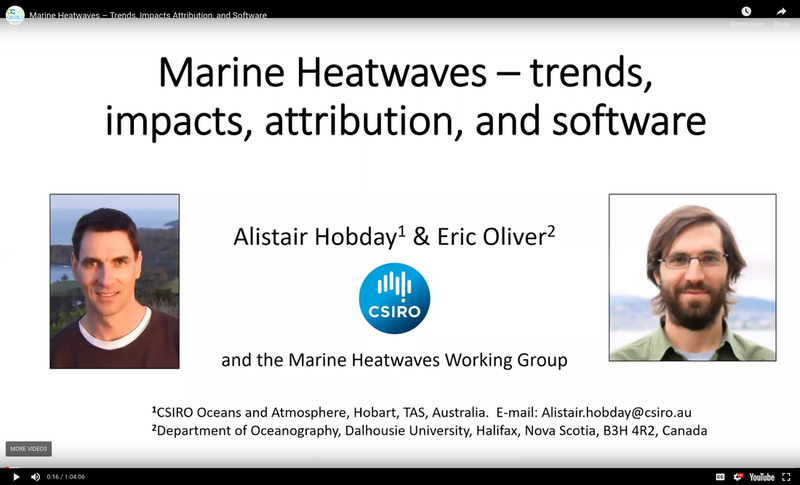 A recent webinar on 'Marine Heatwaves - trends, impacts attribution, and software' was delivered by Alistair Hobday and Eric Oliver. The webinar was virtually well-attended, with nearly 100 listeners logging in from around the world. A video of the webinar is available online. 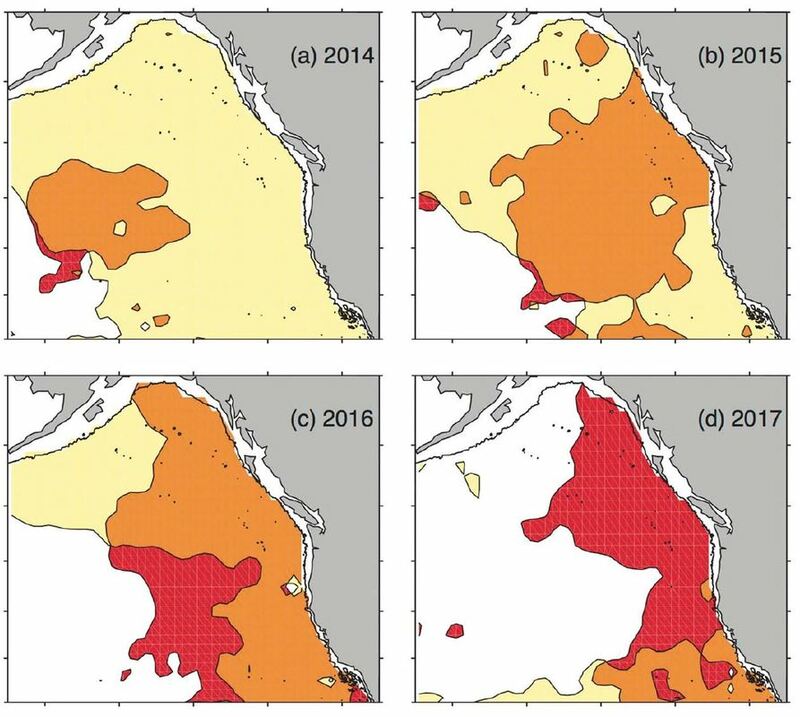 Recent publication by Jen Jackson et al in GRL reports that warm waters have persisted in coastal waters after the 2013- 2015 marine heatwave, nicknamed The Blob, and the 2015-2016 El Niño. Surface satellite data have shown that the warm water was gone by 2016. 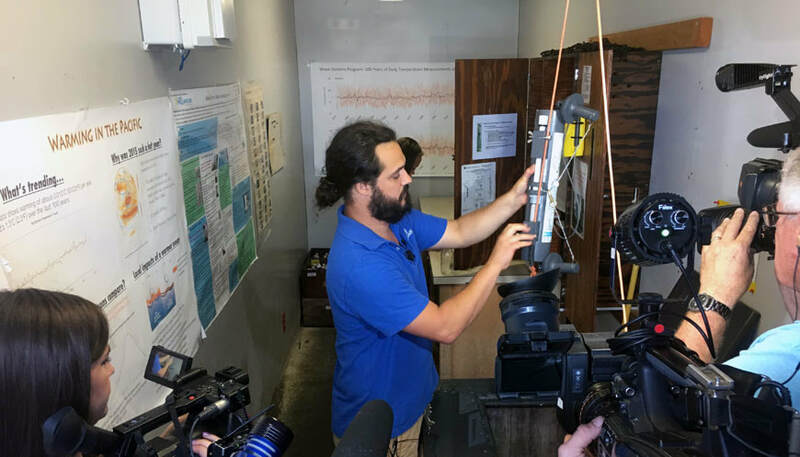 Using temperature data collected by ship and ARGO floats, they showed that abnormally warm water continues to exist in the open ocean below the surface, at about 140‐m depth. In the coastal ocean,deep waters in Rivers Inlet are still 0.3° to 0.6 °C warmer than normal, at least 4 years after The Blob was first observed. This warm water could have a big impact on the Rivers Inlet ecosystem. See the article. New study published in the journal Nature reports on an extensive survey of the Great Barrier Reef before and after a marine heatwave in 2016. The rise in ocean temperatures in 2016 led to a fall in populations of parrotfish, which keep corals healthy and help them recover from bleaching events by eating harmful algae. A heatwave has taken a toll on sea cucumber farms in China, with rising water temperatures killing off many in the past two weeks. 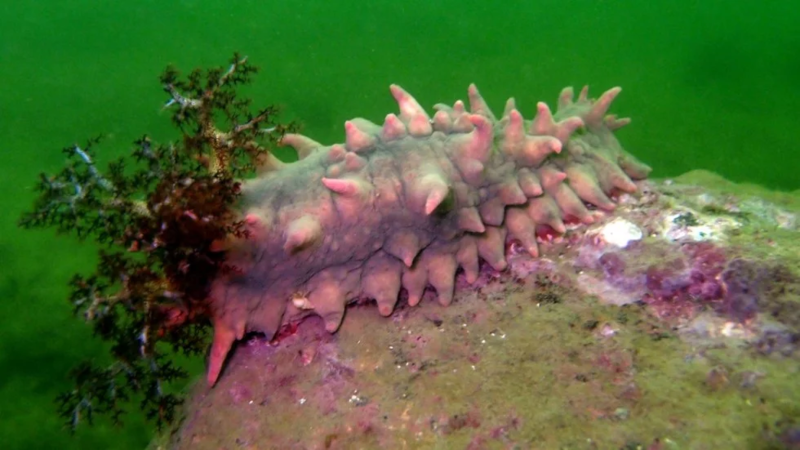 In Liaoning province, most sea cucumbers being raised in shallow ponds with depths < 7 m have died since a heatwave began on July 23. High temperatures made the water too hot for them to tolerate. Source. Sea-surface reading of 25.9℃ (78.6 ℉) highest in 102 years of measurements. See full article here. 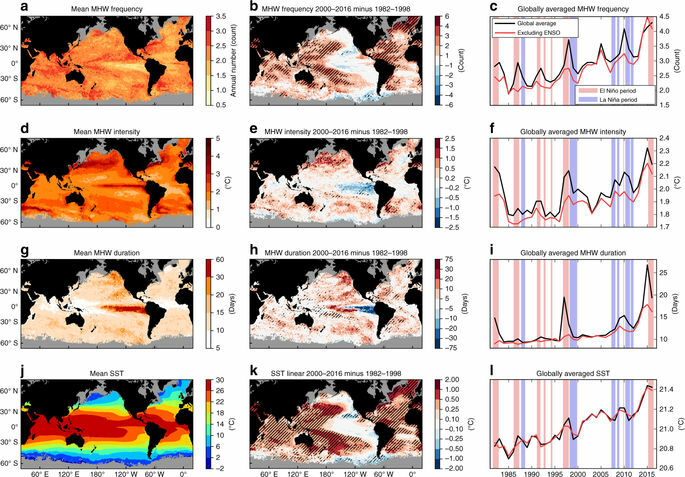 A recent article in Oceanography proposes a system for the categorisation of marine heatwaves. Four categories are proposed - moderate, strong, severe, extreme - which are based on the intensity, or temperature anomaly of the event. The article also discusses potential naming conventions for marine heatwave events, much like for tropical cyclones or bushfires. 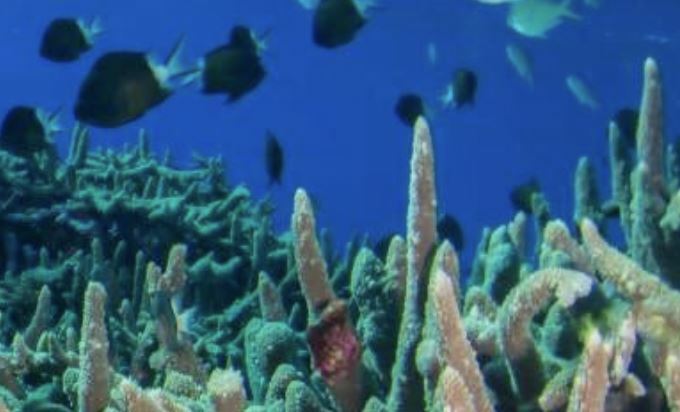 A recent article in The Conversation discusses marine heatwaves and global changes and impacts. Global increase in the frequency and duration of MHWs. Our latest study showed that from 1925 to 2016, global average marine heatwave frequency and duration increased by 34% and 17%, respectively, resulting in a 54% increase in annual marine heatwave days globally. The Pacific Blob of 2015/16 resulted in very high mortality of Cassins auklet. 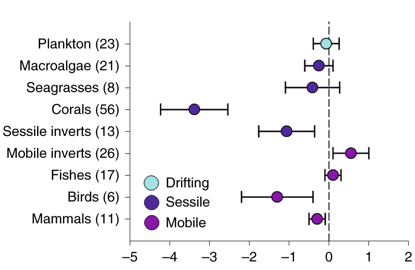 This study combined multi-trophic level information to attribute causes of mortality across a coastal gradient. Jones, T., J. K. Parrish, W. T. Peterson, E. P. Bjorkstedt, N. A. Bond and L. T. Ballance (2018). Massive mortality of a planktivorous seabird in response to a marine heatwave. Geophysical Research Letters 45: https://doi.org/10.1002/2017GL076164. Marine heatwaves off eastern Tasmania increasing in frequency and penetration depth since 1993. The East Australian Current is the dominant driver of marine heatwave variability. A recent study published in Progress in Oceanography. An update on the Tasman Sea heatwave that affected New Zealand. A joint special report issued by the BOM (Australia) and NIWA (NZ) describes the marine and atmospheric elements. 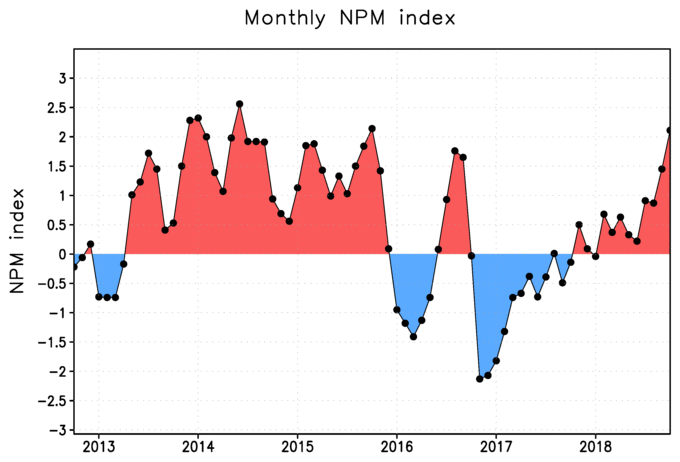 New Zealand recorded it's hottest January on record in 2018, and a Tasman Sea marine heatwave had a large part to play. Three 2016 marine heat waves that killed whales, birds, corals, and shellfish from Australia to Alaska were many times more likely thanks to climate change. A story on our work, by National Geographic. A MHW is currently present south of Tasmania. Here is a piece that describes it from satellite and argo observations. 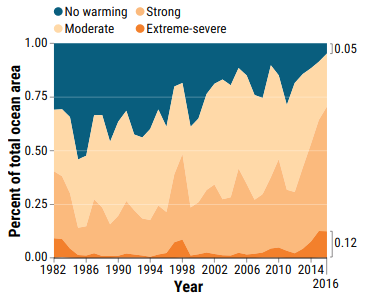 Two major marine heatwaves of 2016 were many times more likely due to anthropogenic climate change, reported in the Explaining Extremes of 2016 supplement to the Bulletin of the American Meteorological Society.